It is nearly a year since I began my trip and I have had the opportunity to speak to about 15 people who are now planning to do the same journey. I have been able to put many of them in touch with each other, particularly the British contingent but there is a recurring theme of people wanting advice on how to prepare for this kind of ride, and what they should be aware of. Hence I thought I would write one more post with a collection of advice to would be travellers. 1.) The main thing to remember is that on the TransAmerica Trail you are not Grizzly Adams. This trail has the massive advantage that it is pretty well populated and so you are never more than 60-70 miles from civilisation at the longest point. This means that there is always food, water, a warm bed and a set of spanners around the corner. 2.) Following from the above point, you don’t need to pack like you are a mechanic. Some people take every type of spanner and sprocket wrench under the sun but this stuff weighs a ton. Take a puncture repair kit, a couple of spare brake pads (buy the ones where you just replace the pad and not the whole metal bit as they are super light), maybe a spare brake/gear cable, and a multitool. If worst comes to the worst and you need a set of spanners in the middle of nowhere, there are SUV’s driving by every few minutes and they can give you tools or if you need it, take you to the next town with your bike in the back. 3.) Clothing – Its not a fashion show. Take 2 or 3 pairs of shorts, 2 t-shirts, a fleece, a long sleeved top, lycra trouser things, underwear and a good rain proof jacket. If it is very cold then wear both t-shirts, your long sleeved top and the fleece together. Have a casual top and a pair of light cotton trousers for towns and maybe a pair of flip flops. You won’t need anything else and will be posting it back home after a week or so. Don’t forget swimming shorts though! 5.) Don’t bother getting a super warm sleeping bag. They get too hot in hot weather and if you are caught in a snowstorm then get a hotel! You got to bed with all your clothes on if it is a cold night and that saves you carrying a mammoth sleeping bag which weighs loads. 6.) Tents depend on your personal comfort. I took a 2 man tent and valued having the room to stretch out and put my bags inside when it was raining. It depends on how much you value having a comfy evening after a long day. I was happy with a 2-manner! 7.) Practice changing your tires. I only had 3 punctures over 4500 miles but hated changing the inner tubes. Whilst you are sat at home watching telly, deflate your tire, take out the inner tube, put it back in and refit the tire. When you’ve done this 50 times whilst watching Eastenders, it will become second nature and not a hassle when you are in the middle of the mountains doing it. 8.) Buy the Adventure Cycling Maps. These are great and really help you find your way. A solid investment. 9.) Having been smart and adhered to my previous points, you should only need rear panniers. I had front and back panniers which enabled me to pack really lazily which is a synonym for heavily. The more space you have, the more junk you will pack. I didn’t have a handle bar bag but wish I did. They are great for storing camera, snacks, pepper spray for dogs and bits and pieces. 10.) Plan your route each day and keep a destination in mind. This helps you keep focused and having a target keeps you motivated. Also, get up early – 5:30am and get a lot of miles in before the sun and the wind kick in. I tended to get 2/3 of my day done by midday. 11.) Stay clean. The bane of cyclists is saddle sores and these will come from not showering regularly since you work up quite a sweat on the ride. Since you can’t shower every time you camp, buy a pack of body wipes from a supermarket when you get there and use them! 12.) Get your bike repaired on the ride – when you come to a big town – Carbondale, Pueblo etc put it into the bike shop for a couple of hours. In the US it only costs about $50 for a decent service and you will be grateful when it runs smoothly and doesn’t break down on you. $50 really is nothing to pay for the peace of mind that everything is working every 1500 miles or so. 13.) Don’t take a laptop. They are heavy things with all the power cables and stuff. Get an iPhone. They are great, perfect for blogging, you will find free wifi in every town bar a couple of really small places. Even if there isn’t public wifi, for some reason in the US, people don’t secure their domestic wifi networks so just hover around and you will pick up a free signal. If you have an iPhone and an iPod then you can save on carrying two chargers as well. Best not to use the iPhone for playing music as this is your main computer device so you don’t want to use up battery unnecessarily. That said, there are power points in every café, diner, church and gas station so you rarely get low on battery. Also, iPhones now have apps like Truphone which enable you to make calls over the web for 1p a minute or something trivial like that so you can call home cheaply. 14.) If you can, then get a US mobile off a friend or someone over there. Then, never use it to make calls home, but buy calling cards from gas stations which enable you to call home for 1p a minute if you can’t use the wifi option on the iPhone. It costs a fortune to use the pay-as-you-go phone to call home without these calling cards. Alternatively, just use payphones using the calling cards as every town has a payphone and you have to pay about a 50 cent premium on the total call cost for using these phones. 15.) Don’t be shy of hotels. If you have had a tough day doing 120 miles in blazing sunshine then don’t worry about being the outdoors man and camping – grab a motel for $40 and have a shower and a movie. You’ll be grateful the next day. 16.) When training for your trip, make sure you do plenty of rides with all of your kit, and ideally do a few days in a row, camping in your back garden if you need to, so that you get a realistic idea of what it is like to be on the road day after day. 17.) Get in the habit of cleaning the key working parts of your bike – chain and cables, and regularly greasing them up. Make this a routine and your ride will be a lot smoother. Make sure you know your way around your brake pads and how to tighten/loosen them etc. 18.) Read a few blogs and get a feel for what problems people encounter but don’t read any within a month or two of your trip as it will spoil the surprises if you know what is coming around the corner (normally a hill). That's just about all. If you have any questions, do get in touch via the address on the front page and I can hopefully put people in touch with others who are doing the ride at a similar time. No probs. Good luck and have fun!! Yo Andy, don't forget how helpful the indigenous rednecks can be. In 1976 as an independent rider I was trying to compress 3 rides into one day and, as I approached Lander KS at dusk headlights blinded me sending me into a ditch, and blew out the lower bearing gusset on my bike (a double century ride made feasible by giant tailwinds!!!) These guys (4th of July) found the only cat in town good with mollebdinum and fixed my bike! The town butchered a few beef and the cyclists ate like starved dogs. God bless America, eh? It is May 14,2010. I have come from Virginia, and am heading to seattle, leaving the transam around oxbow. Taking 2 days off in Colorado Springs (off route) with friends as it is snowing and raining outside. Been a pleasure reading your blog as I prepare for this next very cold leg of the journey. Hope to be done by June 17. Agree with your points at the end- I have a stove but have not used it once, and wish I could ditch the front rack/panniers. Thanks for leaving your blog up- read everything from Pueblo to finish. Hi! Thank you for this! Grate help when planning my transam trip. Thanks for dragging us along on your ride. 2012 and it's still fresh.! 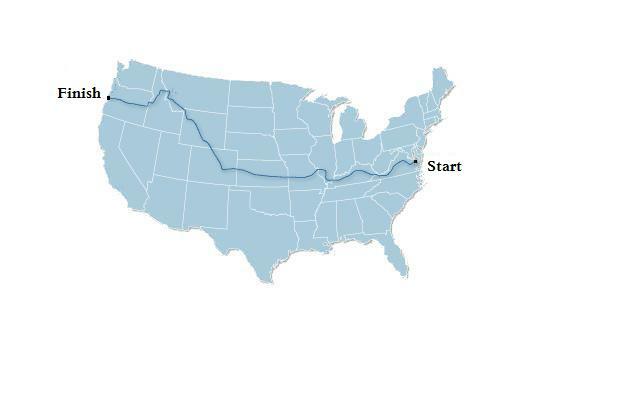 I am a cyclist from London and in mid April 2008 I set off to cycle the 4247.5 mile TransAmerica bike route from Virginia to Oregon, getting back to England in time for my birthday in the middle of June.